Back in January we published a post on the ‘5 Most Common Reasons why Influencer Marketing Fails‘, identifying “lack of understanding from senior management” as a prevalent reason. In order to even give influencer marketing a go, let alone do it well, it is imperative that you’re given permission to sign the project off. With this said, we felt that this is was such an important topic that it warranted an entire post on the subject. Unfortunately more often than not employees either have the know-how without the authority to say yes, or have the authority, but do not possess the know-how. So the chances are if you’re trying to get sign off on an influencer marketing programme, you’re going to have to sell the benefits to senior management somewhere along the line to get the green light. Now, we’re not saying that this is always going to be a challenging process in which you have to overcome lots of hurdles and difficult questions; nor are we denying the fact that some senior managers will possess all the relevant knowledge, but failing to prepare is preparing to fail– as the saying goes. 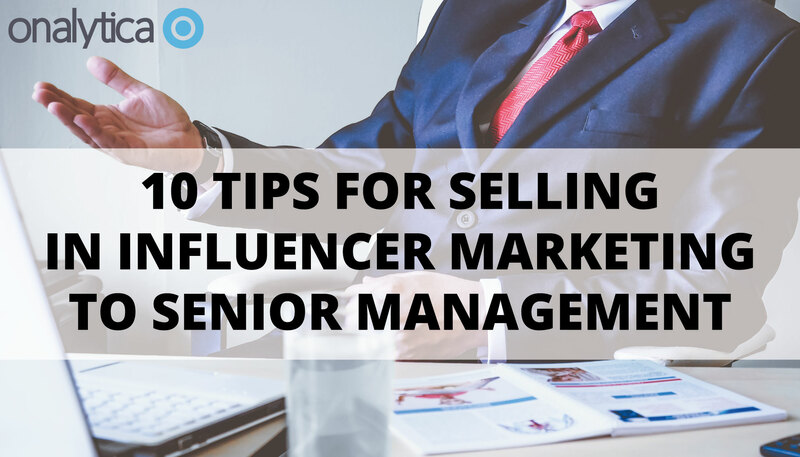 If you’re about to embark upon the influencer marketing journey but are yet to sell the idea to senior management, read on for 10 tips. It is important to keep senior management engaged by presenting in a way that isn’t totally mechanical, however, it is also important to ensure that everything you’re saying is going to add value and contribute to their decision making process. Anecdotes revolving around the success of similar companies in your industry with comparable issues and objectives may be relevant and aid in senior management visualising how everything will plan out- so if you have these to back you up, great. 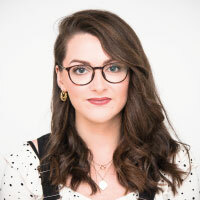 However, this isn’t a time to fantasise on what this could be; telling stories around irrelevant brands successfully implementing influencer marketing may well just get senior managements’ back up. Focus on the facts and stats that enable senior mangers to easily understand and quantify what you’re saying. Their time is precious, show them that you value their time by keeping it on topic and to the point. You’re going to struggle to convince a sceptic if you’re filled with doubt yourself. There are risks and drawbacks for everything; ensure that you’re aware of them and plan around them. Not only will this ensure that you’re able to fight back when questioned by senior management, but your chances of the project being successful will be far greater. Senior management will be impressed if when challenged, you admit that you not only share the same concerns as them, but you’ve considered them carefully and have a mitigation plan. In order to get sign off from senior management, it’s not only important to convince them of the project, but of yourself and your capabilities, too. They need to trust that in your hands, the project has the best chance of success. It’s human nature to want to paint the best possible scenario to impress; however, painting an unrealistic picture will just set you up for disappointment- both in yourself and from senior managers. While you can be optimistic and outline the best case scenario, keep it realistic. Influencer marketing is a new concept that takes time, patience and dedication; you may get lucky and hit the ground running, but equally you may hit a few bumps in the road along your journey. Do your research and make it your aim to really understand how this is going to work. Senior managers are likely to ask lots of questions; some of which because they don’t understand, and others because they simply want to challenge you. Think about the types of questions they’re likely to ask you and prepare some well thought out responses. Ask colleagues with experience of presenting to senior management, or better yet the same senior managers, to shed light on their experiences; what went well for them and what could have gone better. While learning from your own mistakes is of course valuable, if you can avoid making them by learning from others, do- this is far more efficient. On a similar line of messaging to the above point, don’t see this as something you have to prepare for and execute alone. Every business has distinct business functions for a reason; everyone has different skills and capabilities with no two people bringing the exact same to the table; seek help if and when you need it. For example, senior management will expect to be given an idea of the payback time, ROI and break even points- if this doesn’t fall within your remit, then it is best to seek help from finance teams rather than try to blag it. These are elements that senior managers will understand and if there are gaps in your calculations, they will spot them, if not right away, further down the line. Technology is enabling industries to progress at an exponential rate; senior managers, while very knowledgeable, may not have as great of a technical understanding as you. After all, they’re not going to be as actively involved in the project on a daily basis as you are. Do not overwhelm them with jargon that they’re not going to understand. This will just irritate them and ultimately result in you having to clarify what you mean – all this will achieve is wasted time. To add to the above point, do not go too far down the opposite end of the spectrum by assuming they know nothing; insulting the decision maker’s intelligence is not the advisable path to venture down. Understand the aspects they’re likely to know and what they’re unlikely to know. Avoid jargon, keep it simple and to the point. If you’re trying to get sign off on an influencer software platform, refrain from focusing too much of your pitch around running through each and every feature. Senior managers ultimately aren’t going to be interested in the usability if they’re not going to be users. Instead, ensure that you understand the benefits and advantages that can be gained from the software features and how this will contribute to business objectives. For example, if a particular feature of the tool will automate something that you’re currently doing manually, then this will free up time to be doing something more valuable- this is a major benefit that senior managers will appreciate. It is important that you’re able to understand and differentiate between outputs and outcomes; this will aid in you naturally focusing more on the wider picture of working towards business objectives, as opposed to getting too absorbed by vanity metrics. For example, working with an influencer may spark an increase in followers and shares across social media- while this is great, this is an output; the outcome of which may be increased interest in your product/service and an increase in enquiries. While senior managers will appreciate that in 2017 having a presence across social media is important, they see it as being so to keep up with industry trends and competition; the ultimate goal is to increase sales, so anything that you can directly correlate to that will be well received. Key takeaway here is to avoid the ‘so whats’. An increase in followers Are they prospects? Is this feeding into the sales pipeline? Increase in likes and shares of content Have these shares led to increased interest in your product/service offering? Is there a call to action in your content- what’s the conversion rate? Increase in web traffic Have more people been visiting your pricing page as a result? Has this led to increased interest? Have potential prospects been downloading your reports? How many sales have been as a result of these downloads? In order for you to focus on business outcomes that are going to resonate with senior managers, it is of course important that you’re familiar with the business outcomes in the first place. This doesn’t necessarily just entail the business objectives within your function alone, but across the wider business, too. Once you’re aware of them you’re better equipped to make reference to and directly link them to what you’re proposing. If you’re interested in influencer relationship management or influencer discovery, get in touch by clicking the button below.